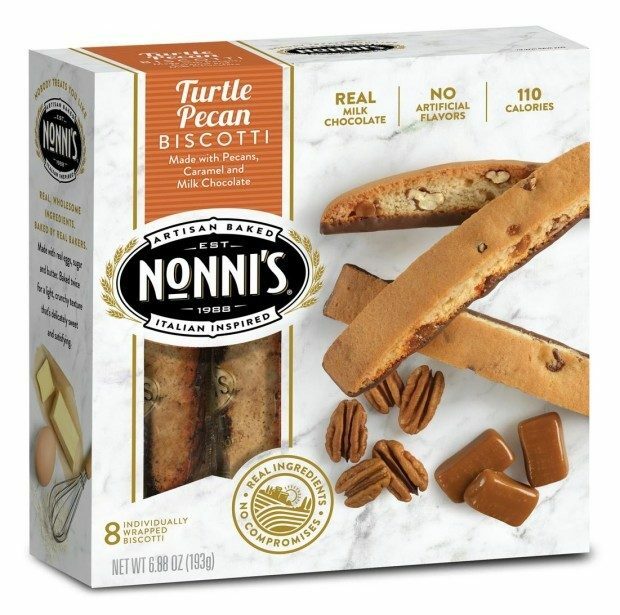 Nonni’s Turtle Pecan Biscotti National Pecan Day Giveaway! You are here: Home / Expired / Nonni’s Turtle Pecan Biscotti National Pecan Day Giveaway! Nonni’s Biscotti is giving us another reason to celebrate National Pecan Day! We were fortunate to get to taste their new Turtle Pecan Biscotti! Do you need an excuse for dessert? Celebrate National Pecan Day, today, April 14 with America’s classic, heart-healthy hickory nut, chalk full of antioxidants and healthy fat. Skip pecan pie and go nutty for Nonni’s Turtle Pecan Biscotti, a light, crunchy, guilt-free cookie perfect for indulging your sweet tooth. Nonni’s Turtle Pecan Biscotti are filled with the finest pecans available, blended with creamy caramel and dipped in gourmet milk chocolate to create a truly satisfying combination. The treats are made with real butter, whole eggs and wheat flour and are only 110 calories per serving! Woohoo! I’m here to tell you that you don’t need to be a coffee drinker to enjoy biscotti! I dip mine in hot tea or even milk! The nutty, chocolate flavor of Turtle Pecan Biscotti is the perfect partner to my breakfast blend tea! Yum! 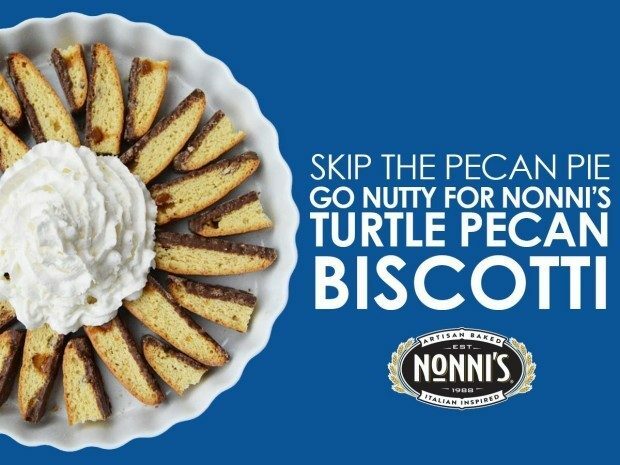 We are so looking forward to giving you a chance to try Nonni’s Turtle Pecan Biscotti too! The delicious, artisan Italian-inspired treats comes in Nonni’s brand new packaging, featuring an enhanced design that highlights the real, wholesome ingredients baked into each piece. The Biscotti will continue to be individually wrapped in portion-controlled packs that seal freshness and maintain the highest quality flavor. Enter our giveaway to win 2 FREE Nonni’s Biscotti product coupons! For more information find and follow Nonni’s on Facebook, Twitter, Pinterest and Instagram. To enter the giveaway, leave a comment telling us your favorite Nonni’s Biscotti flavor! The winner will be drawn at random.